Amid all the apparent confusion over what players need to do to get into the Australian team, some things are just so obvious they don't need saying. 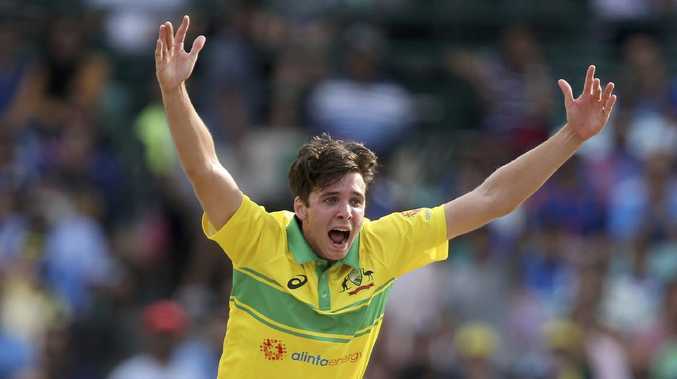 That's why Jhye Richardson hasn't been pestering Justin Langer about what he needs to do to cement his spot in the team after getting the call up while Mitchell Starc, Pat Cummins and Josh Hazlewood are being rested. 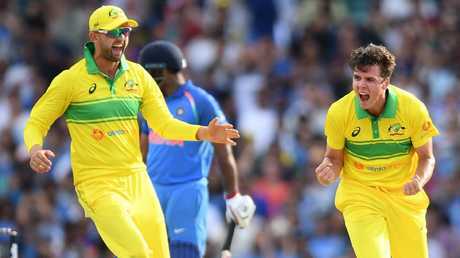 The 22-year-old has already figured it out himself and just gone out on the field and done it, capturing a career-best 4-26 to pick up the man of the match award in Australia's ODI win over India. Performances like that obviously don't go unnoticed and so Richardson has been added to the conversation as who could be the possible bolter for this year's World Cup and Ashes. Jhye Richardson (right) put in a man of the match performance. "The (World Cup) is obviously a long-term goal and it would be great to get there," he said. "That's the dream. And I'd love to play an Ashes tour. Obviously if I keep going well then nothing is out of the question." For Richardson, that's as far as the chatter goes. Chairman of selectors Trevor Hohns insists he'll always phone whenever a player is in or left out and Richardson, whose victims on Saturday included Virat Kohli, will see Langer in the flesh every day during the rest of the ODI series. Even so, the young fast bowler says he won't be hounding Langer because he already knows what happened in Sydney won't count for anything if he doesn't keep taking wickets. "I haven't really had the conversation with him and I don't think I need to just yet," Richardson said. "Justin has said it's a great opportunity to be able to push your selection for the World Cup but we've still got a lot of white-ball cricket between now and then. "So for me right now, I'm just concentrating on these next two games then if I'm lucky enough to get picked for the next tour, I'll be concentrating on those games. "Then if I get picked, I get picked. All I can concentrate on is what's happening now." If Langer does want to chew the fat with anyone about Richardson's raw ability, he'd do worse than to ask India's master batsman Rohit Sharma, who got a close up look at the West Australian while making a century which turned out to be in vain. "He looks a very great prospect for Australian cricket. He's got great variation as well. Towards the end we got an opportunity to see that as well when he was bowling those slower balls," Sharma said. "He bowled pretty well with the new ball and also very well with the old ball. To have skill to bowl with new ball and bowl with old ball as well it's quite exciting."